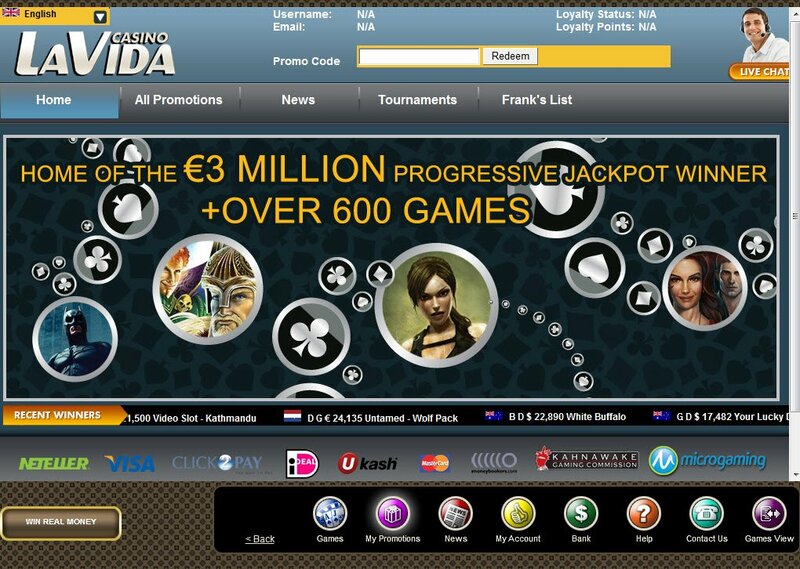 A nice wholesome Microgaming based casino, Casino LaVida lets you live the wildlife and enjoy a whole host of solid gaming opportunities, plus all the exciting tournaments on offer here. With extraordinary bonuses and promotions, I am looking forward to their VIP packages, coming soon but, in the meantime this is an online casino definitely worth a visit. This casino is licensed in the jurisdiction of Kahnawake. They are unable to accept US players at the time of writing this Casino LaVida review. As LaVida Casino downloaded, I was entertained with images of living the good life, sounds were crystal clear, and then the drum and bass beats kicked in whilst I was taken from lounging on the beach to speeding off in my red sports car to enjoy the nightlife Casino LaVida offers. A true taste of what is on offer with this gem of an online casino. 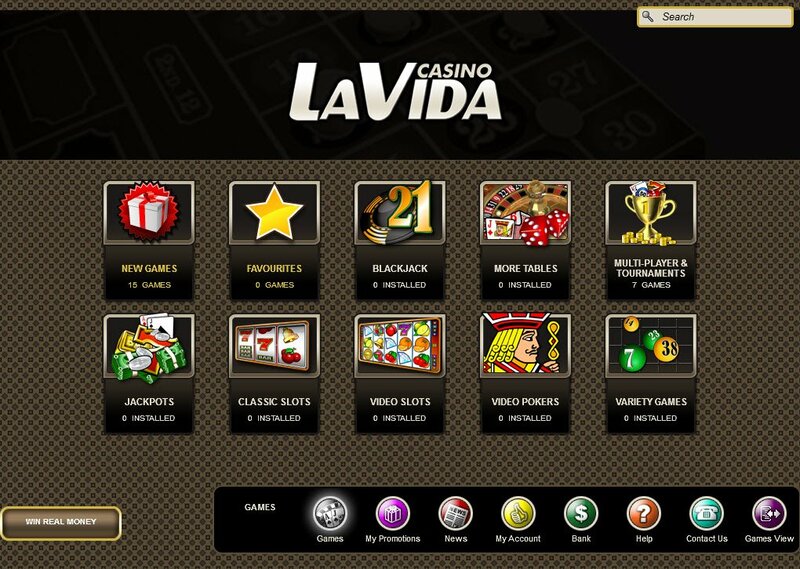 Microgaming is the Casino LaVida software, so we know we are going to get a range of amazing slot games and exquisitely presented table games to play. The Casino LaVida lobby is neatly arranged, with dark and light browns making it a smooth vision for the eyes. When in the lobby, we get the usual hustle and bustle sounds of a casino lobby, ringing machines, murmured chatter, bells and whistles and the like. As soon as we move to a different task online (yes, apparently there are other things to do with a computer than play at online casinos - shocking, I know!) the sounds were muted. I very much appreciate this feature on Microgaming casinos. Neatly arranged into different categories are New Games, currently 15 delicious different ones on offer, Favourites, for me to choose myself, although, as a Microgaming fan, I already know which my top few are without even needing to try them. There are 43 different Blackjack table games available at Casino LaVida, and as a bit of a Blackjack enthusiast, this pleases me immensely. In other table games, you will find 33 different offerings, and if that isn't enough, there are 18 Variety Games for you to get your chops around. For those that like to cut straight to the chase, we are shown an option of all the Multi-player and Tournaments Casino LaVida offers, 7 to be precise. There are the Blackjack tournaments, which are like cat-nip to me, then there are the Multi-player Roulette Tournaments and the Video-Slot Tournaments, with many more options opening up in that list! Be welcomed to Casino LaVida with £3,000 of welcoming bonuses! Made up of your first four deposits, the first one offering 100% up to £100, the second one offering 25% up to £200 and the third one giving 50% up to £200, the last giving 25% up to £125, you'll also get a whole host of complimentary spins on various Casino LaVida slot games and loyalty points. Club Red Loyalty is the offering from Casino LaVda and its sister red Flush Casino, the more you play the more loyalty points you will accumulate, which can then be swapped for amazing Casino LaVida bonuses. There's the "coming soon" Frank's List - a whole host of exclusive tournaments and other VIP gifts, prizes, bonuses and even events, all presided over by bouncer Frank, his earpiece, and his list. If your name is not down, you are most certainly not getting in! 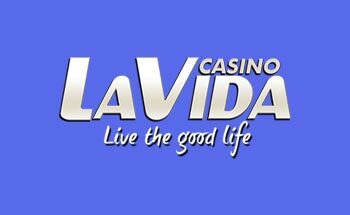 Casino LaVida payment methods available cover the most popular ones, plus a few other options worth looking at. Withdrawing your Casino LaVida winnings is also made easy with the different payment methods on offer. The one issue I found with the helpful and prompt live chat service from Casino LaVida, was its crazy use of Internet Explorer to open my chat! By the time it had loaded, I had made myself a cup of tea and was halfway through it! Other than that, there is a veritable buffet of options for contacting the customer support team.